It’s cold outside. Snow has come, gone, and come again lately. As Christmas approaches in a few short weeks, I love the air this time of year. I love the thought of a silent night, snow softly falling, but then there’s the bright lights and the musical spirit of this season. I am not Jewish, but I was listening to an all Hanukkah edition of a radio show my brother likes to listen to, a college radio station out of New Jersey I believe. I don’t get annoyed by holiday themed music this time of year because it’s really only a short time out of the year. It makes me happy, from older classics to newer stuff, unless the singer goes too wild with their own rendition. I see all the articles about the banning of Baby It’s Cold Outside, on certain radio stations since this whole #MeToo movement. I have read people’s thoughts and opinions on Facebook and thought about adding mine, but as usual, I am somewhere in the middle when it comes to whether the whole thing should have occurred in the first place. I know the song well enough and I am not a fan of it personally, but other people have their own connections to the song and are upset that there’s any kind of pulling from holiday tune rotations. I grew up knowing of Red Skelton from my father and grandparents too. He is a part of my childhood, but kind of from a different time. This song I came across is from the 40’s and things were different than they are in the 21st century we’re living in now. In one version, the male sings certain parts and the female sings the rest. In another version of the song, there is a reversal in lyrics, in lines. Is it a song where one person is pressuring another to stay, to spend the night? Is it more about both wanting to stay, but in those times, concerns over what people will think, a purity thing? Or is it a harmless flirtation? I don’t necessarily think a song should be banned. Many songs, a lot from the 40’s or the 60’s come off, today, sexist and pushy, even inappropriate. People today should be more aware of boundaries and what messages we’re sending. Songs of today can be just as inappropriate, in my mind, but harmless in anyone else’s. Thursday, December 6th, 2018 was an All Women’s Voices day, in remembrance of the 14 women in 1989, Montreal (mostly engineering students) who were murdered, by a madman who hated feminists and didn’t think women should dare go into the traditionally male fields of study. they played and aired all women’s music and interviews with women and girls, about their interests and their fears and the issues they care about, how they’re making a difference. I was interviewed for this, where I wanted to speak about myself, as a woman who is working for more equitable treatment for everyone in our society. These things weren’t taken into as much consideration in years gone by as it is today. Some still think we’re overreacting. Again and again I hear about snowflakes and safe spaces. I know people think we’re making too much of things, politically correct as people like to say, far too sensitive for our own good, but this is a tactic of minimizing someone’s lived experiences and a brush off of possible trauma. I just want people to try and put themselves in someone else’s shoes for a minute. If a song made someone feel uncomfortable, due to experiences they might have had, can we not stop and think about that for a moment at least? The song Baby It’s Cold Outside is still available. It hasn’t been banned from the earth. If certain radio stations choose not to play it now, can you not just go find it elsewhere? On the other hand, we’re not going to get rid of everything. There’s been progress, but there’s still so many discussions to be had. I may sound wishy washy, but I prefer to have a stance, somewhere in the middle of the road. I see both sides, but want to respect all people if I can. I know of so much beautiful music at this time of year. The song in question is jolly enough, I suppose, but not for everyone. My head hurts today, so I think I’ll go listen to some instrumental Christmas music, by the crackling fireside. is the third and final in this three-part thankful series, in honour of the US celebrating Thanksgiving this coming week. Personally, I don’t need a holiday (any holiday) to be thankful. The reminder can’t hurt though. has given us a platform to talk about the issues that we face: accessibility, equality, and advocacy. Check us out. Give us a listen. I’m thankful the program manager at the station asked me to be interviewed for a women’s 24-hour radiothon event on December 6th. We did a pre-record so she can edit to needed length requirements for it to be a piece on the day. She asked great questions, did her research on me, and the interviewed turned out to be super chill and just like two old friends enjoying a casual talk. I’m thankful for a teacher of the violin who keeps working with me, offering strengthening exercises for my hands, fingers and so on. Also, she’s been looking all around (craft stores) and thinking hard of what kind of tactile sticker might work to place on the violin, under the strings, to mark my first/third fingers in the correct placement. I’m getting there, but a little guidance never hurts. I’m thankful for good weather for a parade. Santa Claus was silent this year, not so thankful about that, but we had the perfect amount of time there. I’m thankful for peppermint things, including brownies. I’m thankful for a successful meeting with a travel agent and friend. We’re traveling together, to a women’s travel festival in NYC in March, on International Women’s Day. I’m thankful for sunshine and gently falling snowflakes on cold November days. I’m thankful for a little pre-Christmas weekend celebration with family this weekend coming up. Food. Movies. Celebrations for my father’s upcoming birthday. I’m thankful I discovered a new Canadian violinist. I’m thankful for all my US friends who are about to eat a lot of food in the coming days. Better them than me, as I’ve yet got Christmas to look forward to. Happy Thanksgiving to you all and cheers from Canada. The role gratitude plays in my life is not to be underestimated. Without it, I would be less likely to focus on the good things in life. 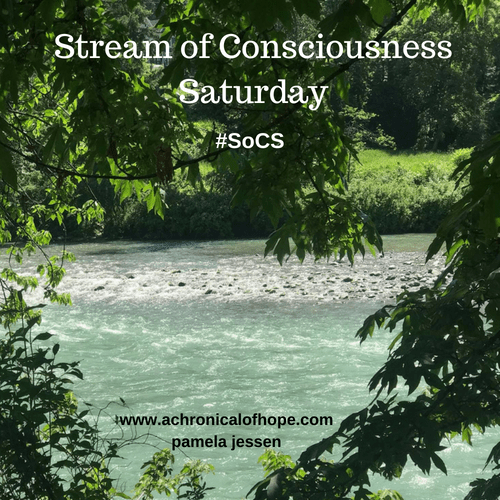 I love stream of consciousness writing and I choose to roll with it, whenever I can let myself care not for the things that might come pouring out from my brain and through my fingertips, onto this blog, and what that might end up sounding like to any perspective readers. on the subject of thanks and giving thanks, but with a five minute time limit. and those things that make me grateful, the role each one of ten plays in my life. It’s Thanksgiving in the States in a few days and they are extra focused in on the things they can be thankful for, despite all the troubles going on in that country. I know the role certain people play in those troubles, but I try to roll with it, with life, because I am here in Canada and can only watch from a not too safe distance, as whatever happens happens. I am trying to focus on the role I can play in my own life and how it goes from now on, while I choose to roll with it, whatever happens because I can’t control everything, or even most things. I can control what I choose to do with the years left in my life. I can think of snow globes and of the fun it was, to be a child during the weeks that are coming up (of Christmas and winter and my birthday), as I imagine myself rolling down a snowy hill. As the days grow darker, I wonder about why darker is harder for people. Sleep and internal clocks and SAD (seasonal affective disorder) are the ones that are most felt this time of year. I get my time from my iPhone, which turns back an extra hour automatically, (will do so again tonight) rather than the clocks on appliances. I like that hour, as there’s a time for everything, even the chance for more sleep, something I blame pain more on than anything else when I don’t get enough of it. Darker is the start of winter, but it is summer somewhere. Australia and New Zealand are down there, waiting for me, but life goes on until then. I go in to the colder, darker season in Canada with an appreciation for where I live. Christmas means darker, but with that five o’clock darkness, come Christmas lights. Christmas makes me happy. I let the additional hours of darkness bring me peace and reflection. I try not to focus on word meaning all of the time, letting my sensitivities get the better of me, but why is dark bad and light good anyway? Our fears hide out there, just waiting for the right moment to leap out and scare us? I’ve written about this before and probably can’t sum it up any better now, as Daylight Savings comes upon us for another year. I do wonder why and then my answer comes, as to why blindness is feared like it is. The idea of being left in darkness for the rest of one’s life is scary, I get it. Still, black and dark are so entrenched in our consciousness as things unwanted and feared. Whether it’s skin colour of another or a state of seeing/not seeing the world. Will we ever get away from such associations? November is one of those more difficult months for me, at certain moments at least, as I look back over past experiences with these thirty days. Things happened to me in this month I won’t ever forget, things that have left solid impressions on the person I am. Zooming out to a broader picture, it means solemn thoughts of war for Canada, with Remembrance Day (November 11th) and this year’s 100year anniversary in particular. I feel worse about the subject of war (the lessons we’ve learned and those we yet haven’t) than I do any dark morning or evening come too soon. Just as many lives were lost in the four years of World War I during bright, daylight hours, just as much death and carnage. Likely, more, as the armies needed the daylight hours to see what they were doing. Night would have been when it was smarter to hunker down in separate trenches wherever and whenever possible. I think of every ghost, set adrift across those European battlefields, and I am haunted by the heaviness of so many souls lost. And I go onward to November 11th this year with a heavy heart once again, though I don’t know exactly why that is. I think of that word often and I don’t need Halloween or a day devoted to wars to do so. This month holds memories, like the hauntings of a shadowy realm. I have all things monsters and ghosts on my mind still, even with Halloween in the rearview mirror for another year. Darker days mean winter and winter means ice. I had to go to the easiest accessible book to me and that was my shelf of all seven Harry Potter stories to find my random word. and a wintery word is what I got. Black ice can be a danger on the roads in Canada, in the months ahead. Scary. A fascinating representation of the things that scare us, threaten to remove all happiness, like the depression that is sometimes seasonal and sometimes all year round. If you can, look at what darkness brings that is pleasant and happy, rather than those things it hides or covers up or frightens you with. Maybe, one day, we can change some of the feelings around what darkness represents. What’s good could be bad and what’s bad could be good. I am back and taking part, after several weeks of distractions and elsewhere’s. Also, I’m writing blog posts and prompts, while avoiding something I should really be doing instead. This is okay, I suppose, but I know I need to get back to it shortly. I read this blog post and wanted all of it. I want to think good things about myself and write it all down. I want to know art and other artists. I like the bottle in the sea idea. I have been slacking, not keeping up reading other thankful posts. I have let myself down, in a couple ways this summer, but then I’ve taken on so much that is new and thrilling too. I’m thankful for feedback that is hard, sometimes/at times more than others, to hear. I know I am learning from it. I know I need to hear it. I know it is part of the deal, of being a writer. I’m thankful for a surprise offer. It came at just the right moment, right after the difficult-to-hear feedback. It was a strange contrast of a day. I could sure use offers like this one to come along, once-in-a-while. It was from a well-known company, with a healthy budget and reputation. I was discovered, just by having my words, in existence, out there in the world. I should be able to brag, but still I am uncertain whether or not to speak details of the thing in question, while contract is still being worked on and leading up to the release date. Still, I had to include it here, in this list, this week. I won’t ever forget that contrasting day of offers, for feedback and for growth and opportunity. I only need to make sure I get it right. I’m thankful for friends/writers who offer me a bit of encouragement when I’m starting to doubt. Editors are unknown and unfamiliar to me, but then that means their job isn’t to make me feel better about myself or to buck me up. I know, logically, that isn’t their responsibility, but yet I probably still am looking for that, somewhere, deep down. Working on it. Friends, those who know the world of writing (creatively or business wise) are the ones who are there, when I need them the most, to remind me that I am a writer, still learning and growing, but yet not at all without merit. It’s just nice to hear it. I am indebted to both editors and writers/writer friends/friends and family, for the contrast. I’m thankful I got to check out a live radio studio. I was in there, going and observing the action live, while my brother put on his Friday music show. I told him, on air and off, that witnessing him in that environment made him seem a whole lot cooler. I’m thankful the woman who runs it wants to give us a chance. She has offered us a weekly half-hour talkshow. We are doing it (based on our podcast/Canadian Federation of the Blind) as a theme. We will talk about disability, accessibility, and equality/equity. We will be current (have call-ins/live guests). and so that’s why we don’t want to do a total copied version of our already-existing podcast together. That is about family/creativity/humour, not strictly about disability issues. It isn’t mainstream radio as most people think of it, known by everyone, but a university radio station supports the arts and local talent, as well as community. It will be more of a reach than we’ve so far had, be broadcasting us to more of an audience than we’ve had as of yet. And so, we are (soon-to-be) available to people, driving in their cars, across London, Ontario and beyond. Also, we are available, online and on Rogers (channel 943). Now, all we need to do is come up with a catchy name for our talkshow that captures what we are about. We have a little less than one month to do this. Sometimes names and titles are easy to come up with and other times, not so much. I’m thankful I got to see a talented singer/performer live. She is a local girl, someone I’ve known from a writing group, full of talent, and full of life. She is animated and energetic. She is many things I wish I could be, but have no stamina to be for long. She is multi-talented creatively. She went to school for musical theatre and she ended up singing some opera (in English/German/Italian I believe). She had to practice, in front of friends, family, and local community, to attend nationally, after having gone to perform in provincials. She sang about men and about eating children. She sang and had two young men performing, so she could take a break. It was inspiring and fun. I’m thankful for a long awaited family reunion. 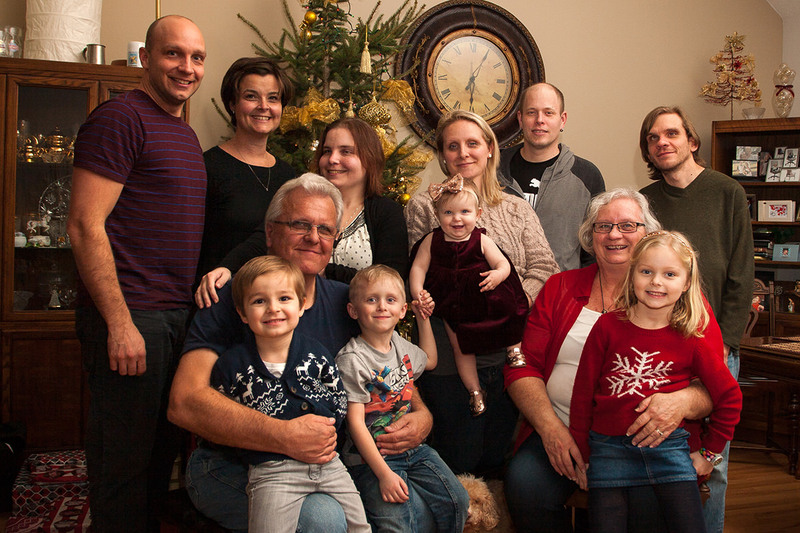 We used to see each other (my mom’s side of the family) at Christmas every year. Then, with every passing year, our group increased in size. Then, both my grandparents passed away, (2005-2010) and we would’ve needed to rent a hall for our gatherings. The decision was made at that time, to stop holding holiday celebrations, and we’ve seen a lot less of each other in the years since. Some of us see each other more than others. It was a beautiful day. I tried to enjoy the day. I don’t do well in big groups, even when it’s family. These are people I have known, more or less, all my life. Some came along in the nearly 35 years since I was born. Cousins have children and some didn’t or couldn’t make it. The children don’t know me. Some of the adults don’t know me anymore and I don’t feel as if I know them now. Still, family is important. There are connections (no matter the time that’s passed us by or the place/life’s circumstances that have occurred). I know we’ve all changed. We’re not the same people we once were. I know there’s a set of roots there, those that run deep. I wanted to reconnect. I can’t make that kind of connection happen again, not with the wave of my hand or by snapping my fingers. It was nice we did it. I do hope we can make it happen every so often. I wish some things were different, but we share a common thread of where we’ve all come from, no matter where we might now be or where we end up. The food was good and the kids had fun. It was on my uncle’s farm, where I grew up staying, for summer holidays, as a child. I was never a farm girl, but my mother had been, like her mother and father before her, and my cousins were, though I did grow up a country girl who would eventually move into town. It ended up the perfect spot for a summertime family reunion. I’m thankful for my August birthday boys. These two writers, along with the rest that P publishes, make me want to keep working to become a better writer myself. they are both featured in, and for “Lost,” the most recent issue. It is full, with each and every new issue that gets released, with the best writers around. It is soon to celebrate its two-year anniversary. Happy Anniversary Panorama! Your name continues to thrill me to no end. The bigger picture indeed. Bomb cyclones, bombshell tell-all’s, and a night out at the symphony. Oh My! And Dolores O’Riordan is dead. It’s been a few weeks since I wrote one of these, not since the start of the new year and my niece’s birthday post. It’s only halfway into the first month of this year and I am already exhausted. I am thankful for Dolores’s voice and lyrics and music. I am deeply saddened, but I am thankful. I can’t believe she is gone. I’ve loved The Cranberries since I was eleven or twelve years old. I’ve been on the verge of tears, giving in to it a few of those times, ever since I heard. I don’t know all of what to say exactly, but I’m sure it will come to me. I am thankful for the cello and a feature celloist. Such a deep and rich sound, such a melancholy sound to the cello. He was making his debut. He was amazing. He even strummed and plucked the strings of his cello along with the fast-paced classical stuff. What a solo with a terrific orchestra to accompany you. I am thankful for an invite to my very first symphony. I felt like the least sophisticated in that place and I was definitely the youngest. Ah well…no accounting for my generation’s lack of taste. It was a first time for me, as classical isn’t necessarily my thing, but I am glad I went. I am thankful I got to see the newest Star Wars with my brother and my sister. We, the three of us, went between Christmas and New Year’s. I was pressed to my seat the whole time, with every new twist and turn of the plot. I realize the giant debate for true fans of this franchise. For me, I like the story, as it stands. I like Adam Driver in his role as villain. One really frigid December night, my older siblings and I ventured out to check it out, and I’m glad we did. I owe my brother, for his description skill, until I can make it so every theatre, even in my little city, has audio description to offer. I am thankful I have a temporary replacement braille display. I can read my own words and the words of other people. I can feel it, under my fingers. I am back, up and running, at full steam ahead. I am thankful I have parents who are perfectly willing to take me to pick up a shipment at the border. There was an issue with a temporary replacement for my braille reader and my options weren’t looking good for resolving it. I had to drive a bit of a distance to sort it out and I am lucky I have family willing to make that drive, over an hour, so I could have the package in hand. Now I can get back to editing and reading, for however long it takes for my own machine to be fixed. I am thankful for my sister’s knowledge of hooking up a new router. Things with the Internet have been lacking around here lately. I went, on a hunch over Christmas, and found and purchased a new router, thanks to my brother’s recommendation. It came in the mail and I wouldn’t have known how to hook it up myself. Thankfully, my sister took time from her busy life and came and got it done for me. I hope to get back to yoga over Skype again soon, without the connection failing continuously. I am thankful for not a no. Sometimes, the postponing of a for sure acceptance to a writing pitch is nice. Some people may not enjoy the extra time, not knowing, either way. I think I needed it, this week anyway. I am thankful for an organization of interested people to stand up for ourselves throughout Canada and the US’s Foundations/Federations of the Blind. I have no need to put down all that the CNIB has done for me in my life, but for the first time, it feels nice to know I am given a say in making things better. I end this week’s shorter than usual and (at times often depressing TToT) with an uplifting song from The Cranberries, one of their later albums. In it, she speaks of not analyzing every little thing and I often need that reminder. I am thankful for this lingering piece of optimism, even in sadness. Thank you, Dolores, from the bottom of my heart. RIP to the powerful voice and the woman who possessed it. Photo caption: Christmas Eve 2017 photo with my neighbour. I’m sitting tight today, between December 24/25th and our family’s second Christmas tomorrow, on this Boxing Day of 2017 and I have plenty to be thankful for. I am thankful for another six months with my kidney. Creatinine was up, from its usual seventy, into the eighties and, of course, even with this slight increase I worry somewhat. The doctor tells me I am doing well for twenty years on and that he has no reason to be concerned at this time. I take this and hold it close as a win, for now. It’s a bit of a tentative thankful, but it is genuine. Best I can do. I am thankful for lunch with my friend from across the ocean. She is a senior resident OBGYN in Cork, Ireland. She has a life there, with her two-year-old daughter. I am happy to hear of their lives and am grateful that they come back at Christmas. We went shopping and out for a nice lunch. I learned about her daughter’s two best friends and their daily routines. Busy girls. It’s just nice, however briefly they are here, that we can return to our familiarity with each other, no matter how long it’s been, how long a year has felt in between last seeing one another. I hope her daughter, as she grows, will soon feel that too. I am just honoured to be Aunt Kerry to another amazing child, if not by blood, relation, than by bestowment through lifelong friendship.. Friendship, I’ve learned over the years is never guaranteed in life, but sometimes it is meant to be, with an extra pinch of additional effort. I am thankful for a quick fix to my heat. I woke up, on Wednesday morning, to no heat at all. By the evening, I was curled up to warm up, but heat had been restored throughout the vents in my home. I had a friend to take me out and a neighbour offering a warm place to retreat into if necessary. I was never in danger of freezing. I worried the workers would be busy this time of year, but I was on a list, and it was short. The problem had something to do with the pressure switch. That’s all I retained from the explanation. It required a pickup of the part, or delivery really, and Bam! Done! And I had just been paid for a writing job and it felt good to be able to pay my own repair bill. I am thankful for a pre-Christmas musical dedication and episode of my brother’s radio show. Sure, Christmas may be over officially, but why not check these songs out. Some are dedicated to snow too, and Hannukah. I heard the song he played, for me, and I proceeded to dance/flail around my living room to it. Good workout and a reminder that Christmas isn’t so easy, for everyone, all of the time. Bah Humbug is too strong for me, thankfully. I am thankful for a Christmas visit and generous gifts from my 2017 neighbour. Wine and Dutch wafer cookies made with honey. She gave me a bracelet and necklace, with my birthstone and a heart, and other charms. I appreciate her in my life, starting this year, and a dear one for years to come. I am thankful for the love of earth and the natural world in a family creation. 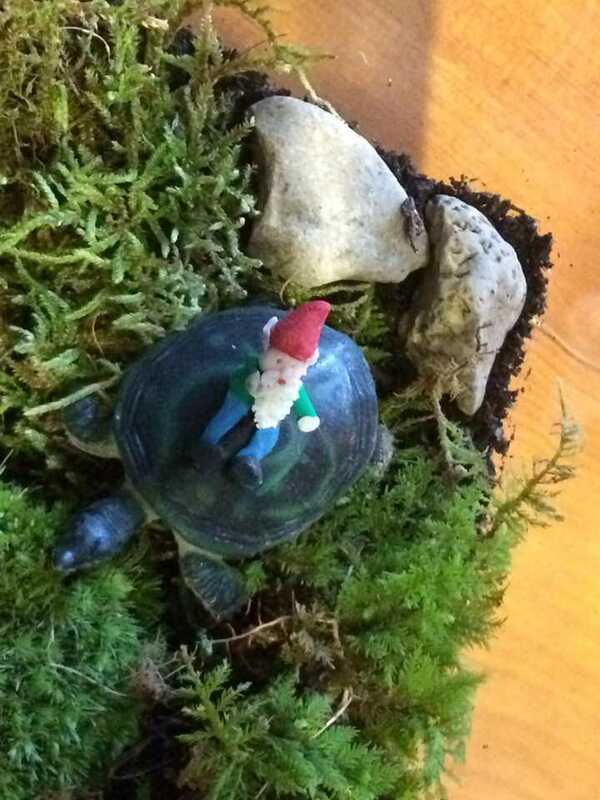 Picked up a mossy world, with a gnome riding a turtle for my dining room’s table’s centre. My cousin was selling them at the Saturday morning market. They find glass jars and other things, like mine which was an old fish tank or possibly a cookie jar at one time. Then they add moss and other things, creating its own little world in a jar. 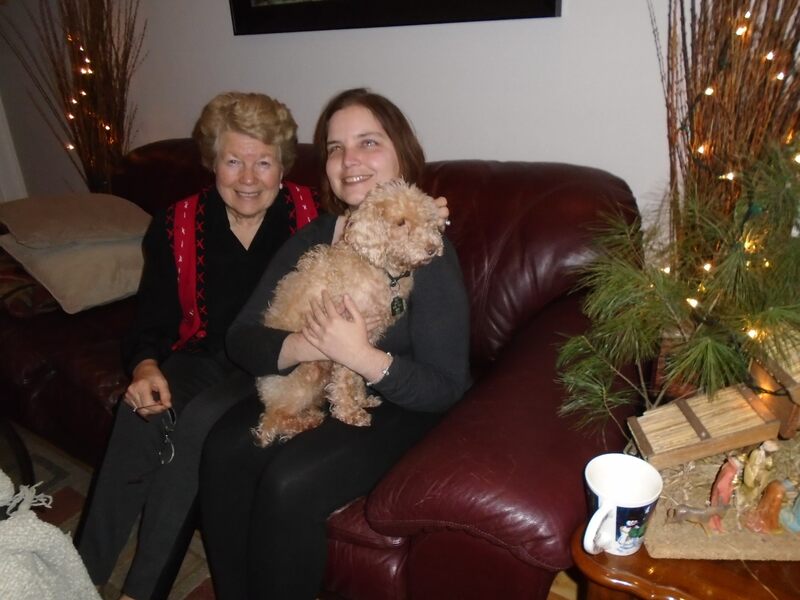 I am thankful for a Christmas Eve morning visit with my friend and her daughter. A two-year-old into Peppa Pig and I found the perfect Christmas surprise: Peppa Pig’s pizza parlour. She loved it and warmed up as the visit progressed. I am thankful we were played and up in the first hour. The audio story I wrote and recorded with my brother was aired on the 25-hour Christmas Eve/Day marathon, on a little college radio station in New Jersey. Jon plays lesser known seasonal songs and a story from a listener, one per hour. He has been doing this for years now and has loyal yearly listener/fans like my brother. It was one of our goals, since he listened and familiarized me with the show last Christmas. We made a plan to send in a contribution from the two of us and we got it done. It was odd hearing it on that show, but a nice way to finish off 2017 on a high note. I am thankful for another Christmas Eve to watch A Christmas Carol with my father. It came on TV at nine and at first, in colour, but my father would rather black and white. I can’t blame him and he found it on another channel. Again, the past and present and future, and I learn and reflect on my life and on the world. I am thankful my neighbour could join us for Christmas Eve this year. She made her signature Caesar salad and served it in wooden bowls she brought back from Costa Rica. Onward to Second Christmas. Hobbits have “second breakfast” and the Kijewski family has “second Christmas”.